Line dancing is a great way to stay in shape and socialize. You can dance with me six days a week at several locations in Phoenix's west valley. Dancing is a passion with me and I have been teaching for more than ten years. I lived most of my life in Michigan and moved to Arizona in 1994. I never danced at all until I started dancing with Joe the dance instructor in Sun City West. I couldn't wait to attend classes and was instantly hooked. I love teaching line dancing. I have been dancing since 1994 and teaching since 2000 and am thrilled to be teaching at Sun City Grand and other locations in Phoenix's west valley. I was and probably still am a shy person but you would never know it when I am teaching, I love it that much. 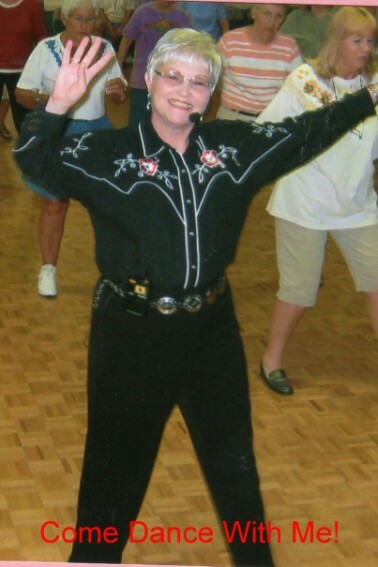 Line dancing is a great way to stay physically and mentally active. We have so much fun at classes and dances, it is also a great social outlet. Line dancing can take you all over the world, I love attending events and workshops. I used to travel on business and would find a club or class that offered dance instruction wherever I was, I have met so many people by just sharing the love of line dancing. I feel very blessed.